The Companion is a sim based on Norvegian folktales, owned by Frigg Ragu a.k.a Mimesis Monday. 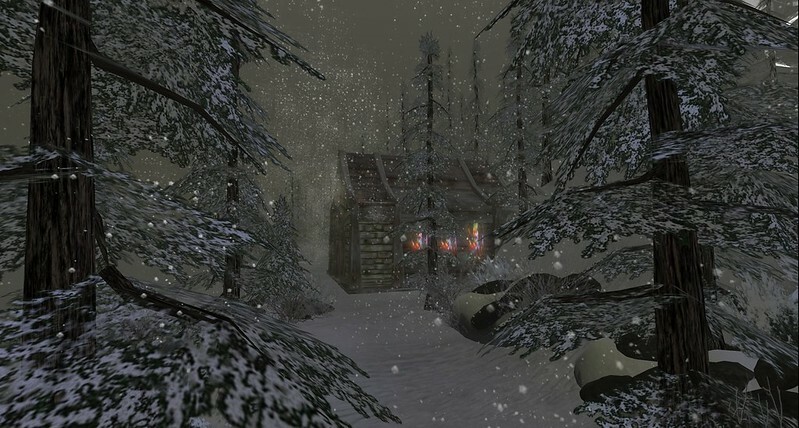 After teleporting to the landing point you'll find yourself in a wintery scene that invites to explore. There are clickable booklike frames that take you out of the cold, to locations in the sky, and there is a path leading between the snowy trees on ground level. Scattered over the sim are snippets of stories, some of them are amusing, many quite ghostly. Except for one story about the origin of the "other people", told close to the start, you won't find any full length stories. Nevertheless it's enjoyable to explore the scenes and to imagine what they are about. Make sure to have sound on when you visit the Companion, because there are many sound effects spread over the sim that add to the atmosphere. Also turn up your draw distance, as there's much more to see than noticeable at first sight. Finally it's also worth the effort to play with your windlight settings to enhance the spooky atmosphere.